The EB48 has been carving out its place as the top 1/8th scale electric buggy for many years now. Through its history, we have continually improved on every aspect of performance and durability. The progression from the EB48 to the EB48.3 evolved through many significant changes, industry firsts, and also hundreds of fine adjustments. With the introduction of the EB48.4, we have once again raised the bar and improved on nearly every aspect of the buggy. This time it took the form of many fine adjustments, but the leap in performance is our most significant yet. These changes feed into one desire to manufacture the best handling, most consistent, most durable, and highest value kit on the market. We’re confident that our wonderful customers will agree that we have delivered on these goals. We have never offered a more predictable yet aggressive steering system to the 1/8th market. Steering response and durability has been improved with new bearing supported spindles (TKR8041) and spindle carriers (TKR8194A). By reducing the wheel offset, we further improved the geometry, allowing the buggy to get in and out of corners more consistently in all conditions. 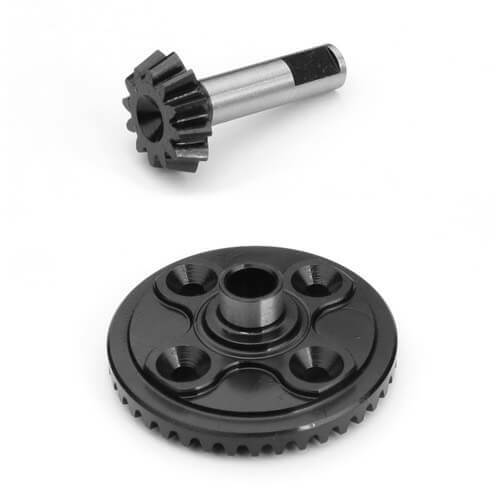 New front arms (TKR8286) now employ the same double-nutted outer hinge pin (TKR8034) design as the rear arms, ensuring nothing comes loose during a race, as well as fewer parts in the toolbox. In the front, shock absorber placement remains the same as the EB48.3. So expect the same great jump landing and bump handling characteristics. 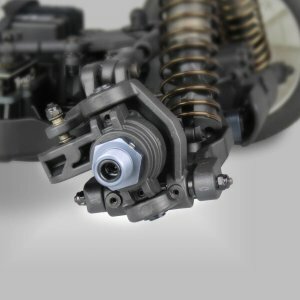 The new Ackermann plate (TKR8100) and steering bell cranks (TKR8104) smooth steering response, providing better stability out of corners without sacrificing on-power steering. Finishing off the front end are new A and B blocks (TKR8161, TKR8162) that have a more user-friendly 2.5mm hex cap head screw (TKR1533) to access the diffs. 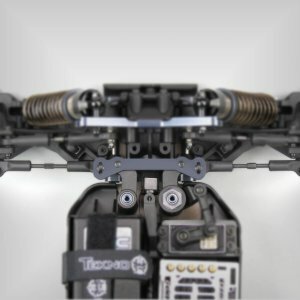 New rear arms (TKR8184) and hubs (TKR8040A) have been designed to accommodate wide rear pivot (TKR8163, TKR8164) hinge pin blocks, producing increased corner speed and improved forward drive out of corners while reducing weight transfer. As we did with the front end, more user-friendly 2.5mm hex cap head screws have been included for easy diff access. By utilizing a new hub design, the arm length remains the same, keeping the same great jump landing and bump handling. 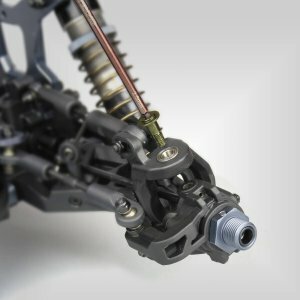 The EB48.4 now utilizes front and rear universal driveshafts (TKR8087). Through rigorous testing, we have found universals provide the most consistent performance due to their improved bump handling which allows the suspension components to move more freely and efficiently. Internal gear ratio (ring and pinion) has been modified to 3.33:1 (TKR8151, TKR8152), extending battery life while providing improved power transmission from the center diff to the front and rear diffs. The new gears are also quieter and more efficient than ever before. The EB48.4 features an all CNC shock package, from the shock bodies to the internal guides (TKR6146B). 4×1.9 flat/flat pistons (TKR6165) further refine the damping package and are suited for just about any track condition. 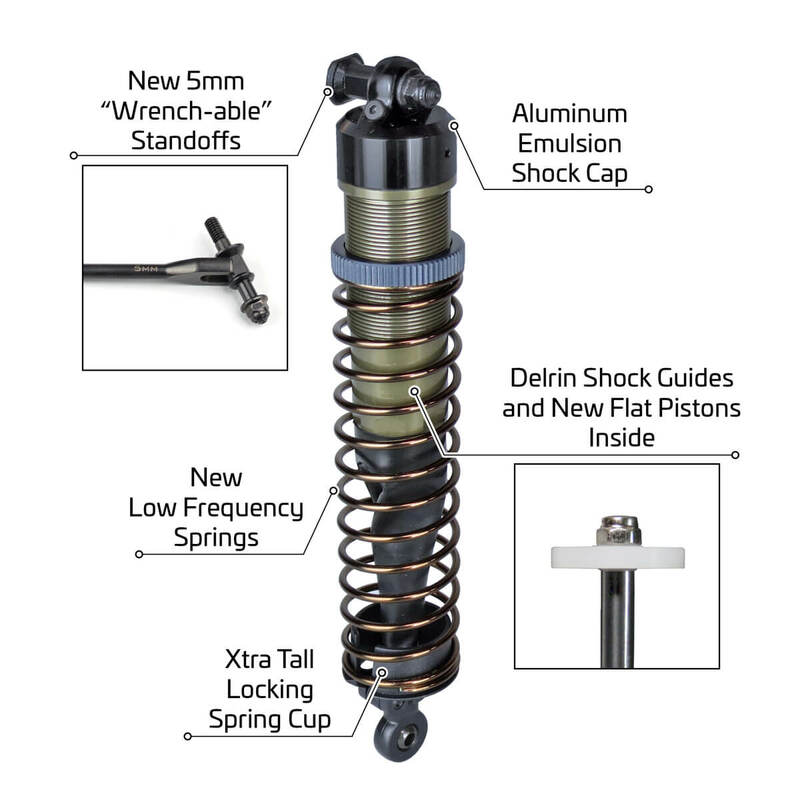 The highly regarded LF (low frequency) springs (TKR8763, TKR8773) are now included as stock equipment as well. Topping off the updated shock system are new CNC 7075 aluminum bleeder caps (TKR8702) that allow you to build your shocks any way you prefer. The standard shock build is now an emulsion setup, but the new caps can be used to build vented and traditional non-vented shocks just as well (optional bladders required). 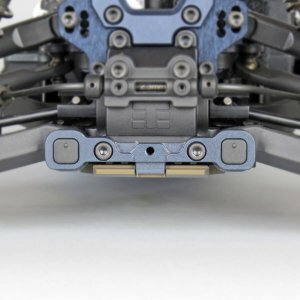 The new caps mount to revised shock standoffs (TKR8027) that provide better clearance between the cap and shock tower. The original EB48 body was a departure from the wide nitro hand-me-down bodies. 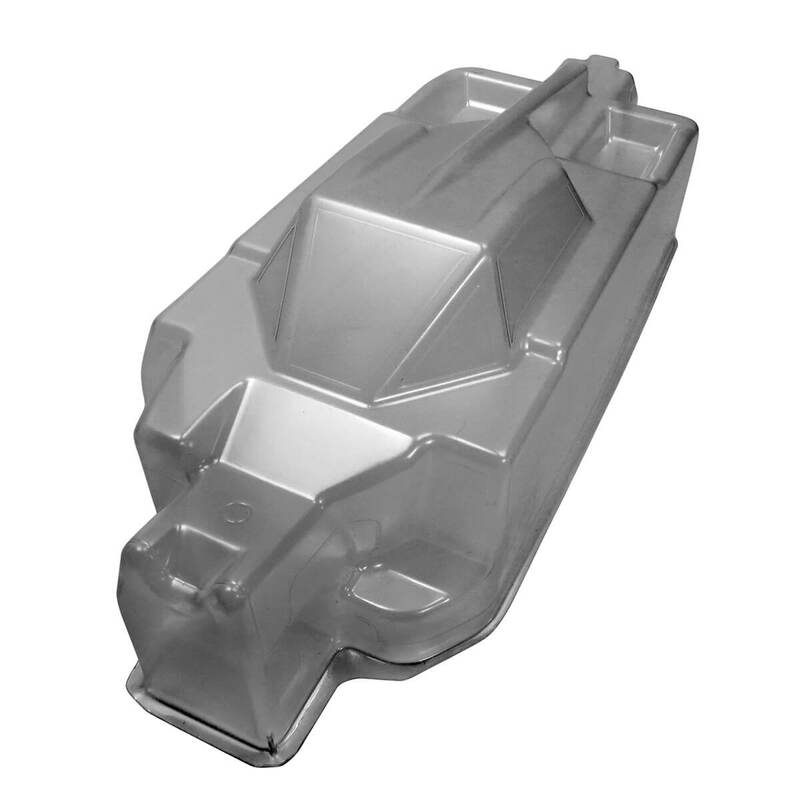 With this release, we have further improved on our design to offer a body providing more internal clearance, higher durability, and improved aesthetics. Aggressive fighter jet inspired styling produces ample steering with sleek lines followed by three fins to help with high-speed stability and small spoilers on the rear to increase downforce. Also featured are several indicated ‘cut’ areas to improve airflow to the chassis and lower the temperature of your electronics. Designed to be electric from the ground up – no nitro conversions here! 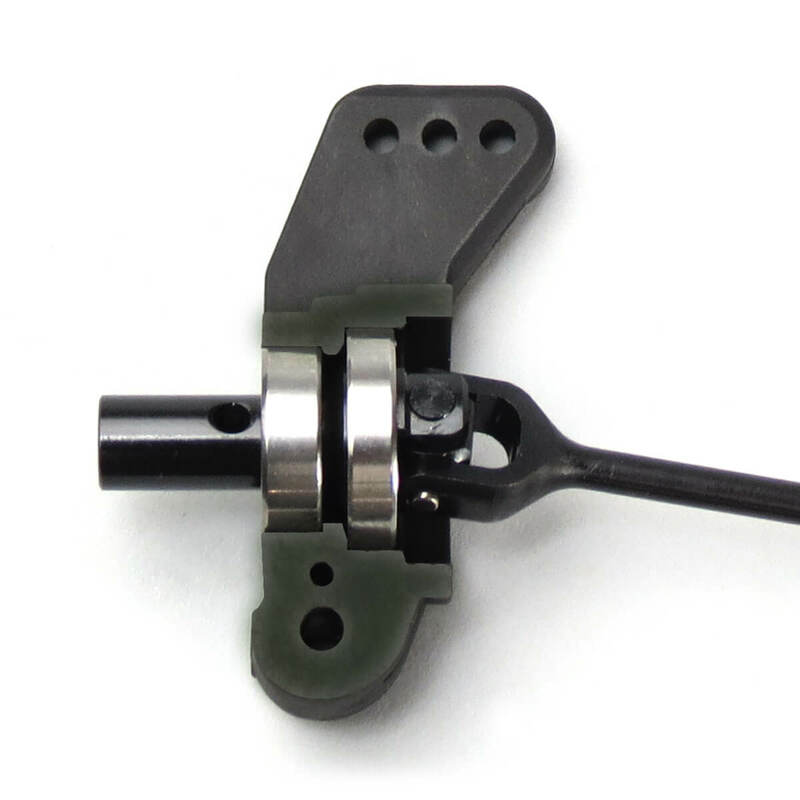 New 4mm CNC 7075 aluminum hard anodized lightened chassis with improved wear characteristics. Super narrow chassis layout – widest point is only 125mm (less than 5”) mudguard-to-mudguard. 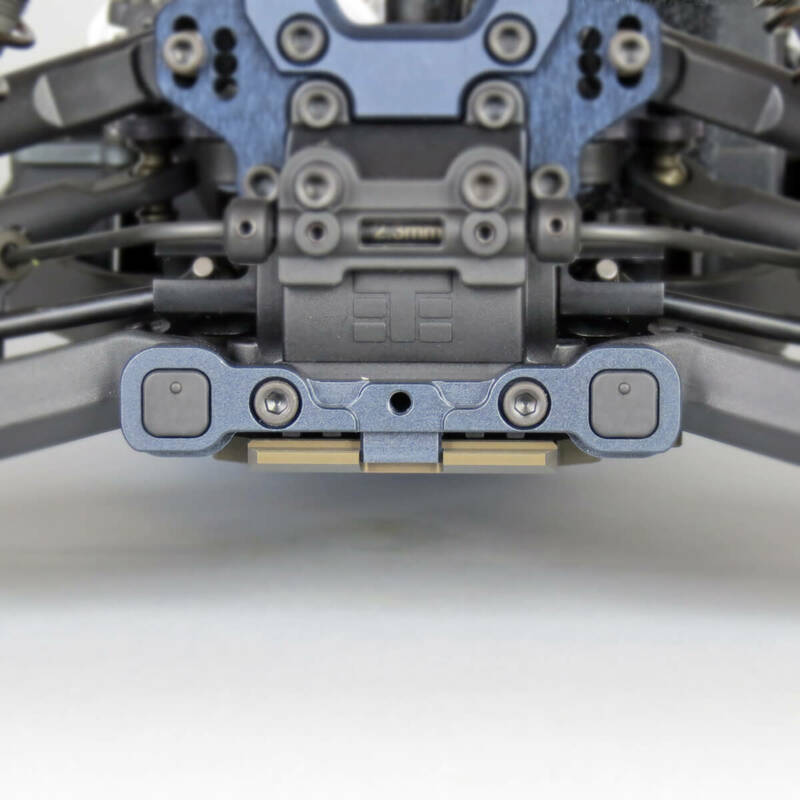 Class leading front and rear clearance (short chassis overhang) provides better bump handling and jump landing. Integrated battery tray/mud guard, the battery is sunken into chassis for a super low COG. Adjustable, LCG lightweight wing mount. Integrated electronics tray/mud guard for easy removal of electronics. Spacious, enclosed, easy access radio box with integrated transponder mount. Single pack configuration is better balanced, lighter weight, and makes battery changes easier. Battery tray accommodates 2x2s packs. 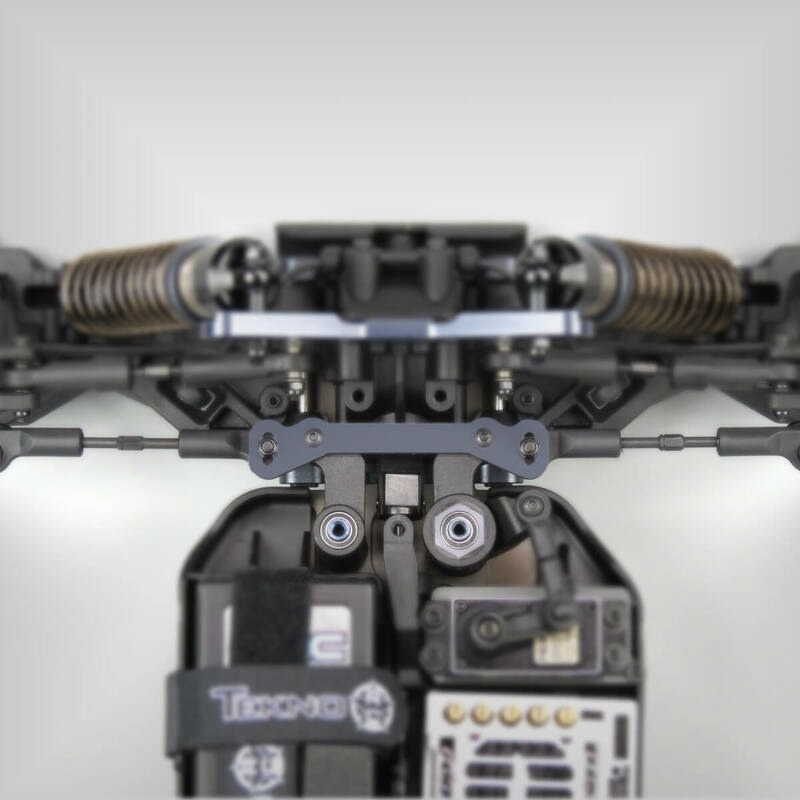 Adjustable chassis brace system for fine tuning flex with front, center, and rear braces. 2-piece CNC aluminum motor mount with precision dual clamping gear mesh adjustment. Split center diff mount for easy maintenance. Uses standard MOD 1 pinion gears (TKR4171-TKR4190). Three fluid-filled adjustable super lightweight diffs. Less rotating mass = better acceleration. Lightened outdrives, and diff couplers used throughout. Aluminum tapered aluminum center driveshaft. New 12/40 ring and pinion gears for improved efficiency. Angled rear gearbox with large bearings. Straight center driveline for maximum efficiency and minimal wear. New universal driveshafts with narrow stub axle and revised bearing placement. Super smooth 16mm big bore shocks. 6mm front, 5mm rear CNC 7075 aluminum gun metal anodized shock towers are standard. New flat/flat piston design and configuration (4 x 1.9mm). Fully adjustable long travel suspension geometry maximizes stability and traction while providing superior cornering and on-power steering. CNC threaded shock bodies, caps, cartridge caps, and adjustment nuts. New CNC 7075 emulsion/vented/standard shock caps. 4mm hardened and polished steel shafts. 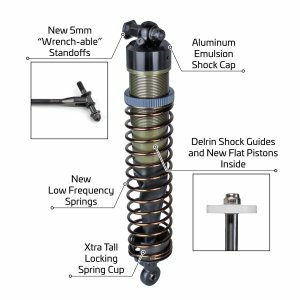 New tall clamping spring perches with captured shock boots. New CNC delrin internal triple guide design for true and consistent shaft action. Optional springs and sway bars are available. Adjustable front arm sweep and angle to make the car more aggressive (swept forward), or easier to drive (swept back). New captured outer front and rear hinge pins. ‘Narrow pivot’ steering posts provide ‘0 bump’ geometry with almost ‘0 steering slop’. Adjustable CNC 7075 hinge pin braces. New bearing supported spindle/carrier with updated geometry and enhanced durability. Long rear sway bar for improved consistency. New ‘Wide Pivot’ C and D hinge pin braces. 4mm inner, 3.5mm outer hinge pins, polished for smooth action. New narrow high roll center rear hubs. Adjustable Ackermann and bump-steer (bump in, zero bump, bump out). New aluminum Ackermann plate rides on four precision bearings. New steering bell cranks with optional solid right bell crank (no servo saver) for increased steering response. Adjustable steering stops for precise steering travel settings. New high downforce wing with hole guides included. Easily adjust anti-squat, rear toe, front arm angle, front arm sweep, roll center, toe, camber, wheelbase, Ackerman, bump steer, suspension geometry out of the box. Full set of option parts available. Extremely easy to work on with minimal screw count. The new .4 is a weapon, was really happy with my .3 by the end of last season, but even on just box settings i'm almost 2sec a lap quicker average now, Tekno got the EB48.4 on the money! Does everything great and Tekno's are always durable.